Posted by Andrew Fentiman // July 20, 2013 // Gold, Investment, Money & Finance, Silver. What if you awoke one morning and the U.S. Dollar – long past its prime – was dead, having become a worthless U.S. Dullard overnight? Day by day, it is becoming more of a probability than a possibility. One thing is certain: when it comes, it will be sudden, swift, silent and totally unexpected. Woke up at dawn, restless. Turned on tv. News channels all blaring, everything is Breaking News. 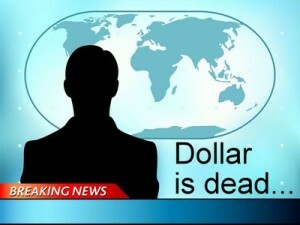 The U.S. Dollar has collapsed on international exchanges and is no longer the world’s reserve currency. No one saw it coming. 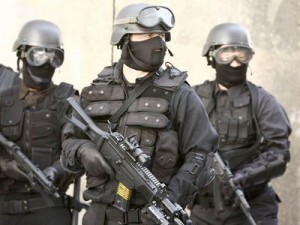 Video plays of SWAT teams roaming Wall Street. The police are nowhere to be seen, although sirens drown out the live coverage. Stragglers hurry past shuttered banks; they only contain worthless dollars anyway. Trains, buses and taxis are at a standstill. City and rural services are closing down. Stores are barricading doors and windows, afraid of looters. The news anchor says a report just came in that communities are forming militias to protect themselves. A scrolling ticker line has just appeared along the bottom of the tv screen, quoting live prices for silver (now $79) and gold (just hit $2,431). There is a rush to exchange worthless paper money for goods. Barter is back, big time. 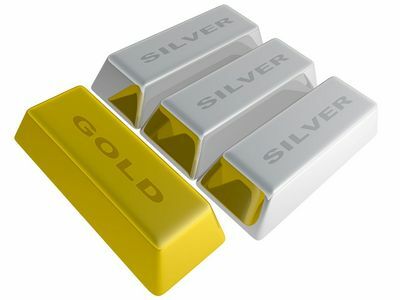 Silver and gold are the new currency – the timeless store of wealth and value – and they are skyrocketing. 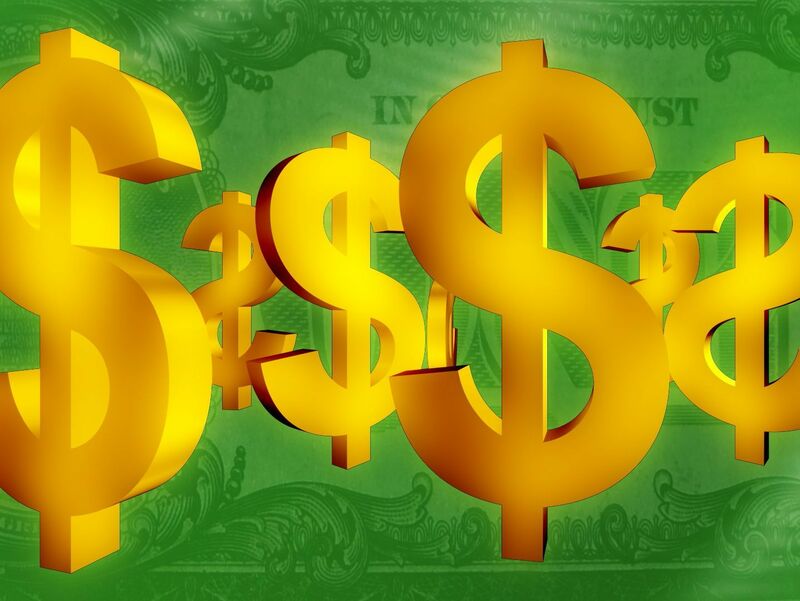 It’s a race against time for those with their net worth in dollars, trying to swap garbage paper currency for valuable goods or precious metals, “before the music stops”. Silver is now at $194 and gold has reached at $6,806. The tv reports an impromptu market, setting up on a nearby street corner. It’s for barter only: dollars are not welcome. My neighbor bangs heatedly on my door. “Do you own any guns?” he yells. Is he crazy, or thinking ahead? I can’t decide which. I check the lock on my door and close the blinds. Have to think. Prioritize. What should I do first? I am glued to the tv. Frozen. Helpless. Unfolding tv scenes remind me of watching the Twin Towers in disbelief. But once again, it’s a real-life disaster movie, unfolding frame by frame in front of me. ARE YOU FEELING PRETTY GOOD? Ask yourself, were you one of the smart ones who bought gold and silver, when you were advised to do so? Posted by Andrew Fentiman // July 6, 2013 // Money & Finance. Having just celebrated our own independence and freedom on July Fourth, recent events in Egypt provoke questions about the stability and longevity of our own democracy. Q. In an era when social media can motivate millions overnight, at what point do tens of millions of demonstrators, protesting on the streets against the status quo, gain the moral authority over a democratically elected but increasingly onerous and misdirected government? Q. In a nation with ever-evolving restrictions on private gun ownership, can we rely on the armed forces to recognize such a turning point in the tide of populist protest, reassuring ourselves that the armed forces will always side with the masses and eject a despotic leadership? Q. As believers in democracy, should we meekly accept the ascendancy of a disastrous or reprehensible political philosophy, simply because they won a majority at the ballot box? In America, we believe we are not susceptible to widespread social unrest and are perhaps immune to revolution; after all, we already had our American Revolution. REV: The British thought the colonies should be utilized in ways that best suited the Crown and Parliament. EGP: Mubarak, and then Morsi, thought that Egypt should be governed in ways that best suited the leaders in government. USA: The ever-expanding Fed thinks that government should serve the best interests of government and the administration’s favored few: federal workers, trade unions, political supporters, etc. REV: Increasing disagreement over the way Britain treated the 13 colonies, versus the way the colonies thought they should be treated. EGP: Increasing disagreement over the way the government treats the people, versus the way the people think they should be treated. USA: Increasing disagreement over the way the government treats the people, versus the way the people think they should be treated. REV: A rallying cry of the revolution was ‘No taxation without representation’, combined with the common sentiment that the people were taxed too greatly. EGP: Egyptians feel they are over-taxed and over-regulated to the point of deterring business opportunities and entrepreneurship. USA: A majority of Americans has lost faith in the IRS, believing the tax code should be simplified and made fair or flat, a concept with which the administration disagrees. REV: The colonists had a strong streak of independence and a desire for greater opportunities and more freedom. EGP: The Egyptian people demonstrated a desire to break away from authoritarian rule, to have more religious freedom and to have the chance at a better life. USA: An increasing number of Americans believe in limited government, but we have an expanding Fed and live in an over-regulated, overly politically correct, over-taxed, nanny state that spends money on wasteful projects like a drunken sailor and increasingly infringes on individual freedoms, business enterprise and property rights. REV: The people’s desire for economic freedom and opportunity, unburdened by government. EGP: The people’s desire for economic freedom and opportunity, unburdened by government. USA: The people’s desire for economic freedom and opportunity, unburdened by government. REV: Colonial legislatures had developed a measure of independence from the Crown and were used to operating at the local level, a practice the Crown sought to diminish. EGP: Religious organizations had evolved a system of mutual cooperation and respect, even though Islam is the dominant religion, a tolerance that Morsi and the Muslim Brotherhood sought to curtail with the imposition of Sharia laws. USA: States have exercised their rights in ways that have brought them into conflict with a Fed that increasingly seeks to bully and interfere with States’ rights. REV: A government out of touch with the people, not representing the will of the people. EGP: A government out of touch with the people, not representing the will of the people. USA: A government out of touch with the people, not representing the will of the people. REV: A government trying to confiscate the arms of the people, to prevent the people’s militia resisting despotic government. EGP: A government that had already banned gun ownership – the sine qua non for authoritarian regimes – to prevent the people’s resistance to despotic government. USA: A government that constantly tries to restrict or ban private gun ownership, an approach successfully used countless times throughout history to pave the way for authoritarian rule. REV: The British Currency Acts (1751 & 1764) restricted the colonies’ issuance of paper currency and then outlawed the use of paper money to settle public and private debts. EGP: Egypt’s foreign currency reserves have been halved, causing the Egyptian Pound to plummet in value. USA: The Fed is printing $85 billion a month, devaluing the fiat currency and turning the U.S. Dollar into the U.S. Dullard. 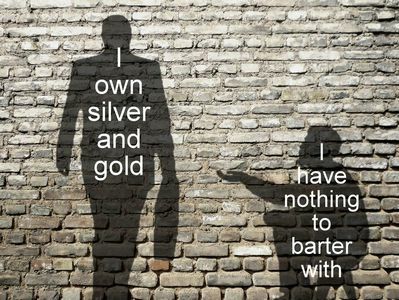 Meanwhile, gold and silver – the only true money – are denied the status of legal tender.